Hello, Engaged & Inspired Community! I’m Brianne, and I am so happy to be here as a new Blogging Bride to share my wedding inspiration and all the fun along the way. I thought I would take a few minutes to introduce us (me, and my fiancé, Erik) to you guys so you’d know a little bit about who we are and what we like. That way you can see the people behind all the inspiration we’ve collected and decisions we’ll be making. Our biggest "thing": we’re in a long distance relationship. We’re both from the greater Seattle area, and we met at a New Year’s Eve party 5 years ago. Just before we met, Erik had enlisted in the US Navy and he was scheduled to leave to start his training in the spring just after we’d started dating. His training was only supposed to be about 18 months and then he was scheduled to be stationed back in WA. Well, so much for planning (if any of you are Military Spouses you know what I’m talking about!). In the end, he was stationed on the USS Roosevelt Aircraft Carrier in Norfolk, VA for the remainder of his contract (4 years!). Fast forward 3 years, and after a lot of cross country flights (and a lot of frequent flyer miles! ), Erik asked me to marry him. Long distance relationships are certainly a challenging road, but we've found a way to make it work. It certainly has made wedding planning interesting! So: more about who we are! I have a career as an architect, with a design and lifestyle blog on the side. I’m crafty, love working with my hands, and also love bright colors and have a creative spirit. I’m a Leo, with curly blond locks to match. Erik keeps me sane. He’s a nuclear engineer for the Navy, and he’s got a much more analytical side. He’s more technical (and rational) but also with a creative bent. When we do spend our time together we like to get out for hikes, do crossword puzzles, and discover great restaurants that serve amazing food. We’re also totally nerdy and play video games and watch a lot of netflix as a way to stay connected across the miles. I think you’ll see a little bit of our geeky side come through later on. Because the military can make any plans unpredictable, we’ve decided to wait until Erik is out of the Navy to get married. We’ve been engaged for 9 months already and have about a year to go. We’ve chosen a venue and set our date for 4/5/14 so we have plenty of decision making yet to go. I’m hoping to share with you both the challenges and benefits of a long engagement, because there certainly are both and I think long engagements can get a bad rap. Thanks for having us, we can’t wait to share what we’re up to and hear your suggestions! Photos are excerpts of our engagement session with our fab photographer Carina Skrobecki, taken at the Volunteer Park Conservatory in Seattle, WA. It's here! Our wedding week is here! At this point, it doesn't seem real! The event that we have been talking and planning for months is now here and I am just supposed to be relaxed and "take in every moment"?! My family and friends will know how hard this will be for me but I am going to try! Obviously, the most exciting part is marrying my best friend and the person who makes me laugh on a daily basis, Eric! I can't wait for our first look to see how handsome and happy he looks! 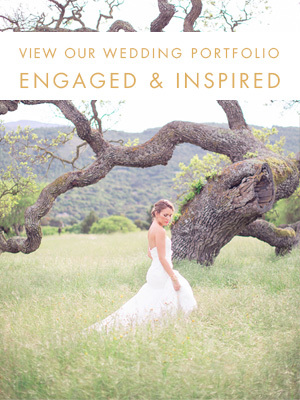 I thought I'd post some of my favorite inspiration photos through the wedding planning process! It's been a blast posting on Engaged and Inspired and I can't wait to share all my wedding day photos with all of you! This past week we worked on finalizing our stationary for the wedding. We used a stationary and wedding boutique in Tempe, Arizona for our invitations and LOVED working with the owner! Plus we loved the way our invitations turned out, so we knew we had to go back for the day of details! If you live in the Arizona area, make sure to check out Definitely Debra. Picking out our wedding invitations was actually quite simple! 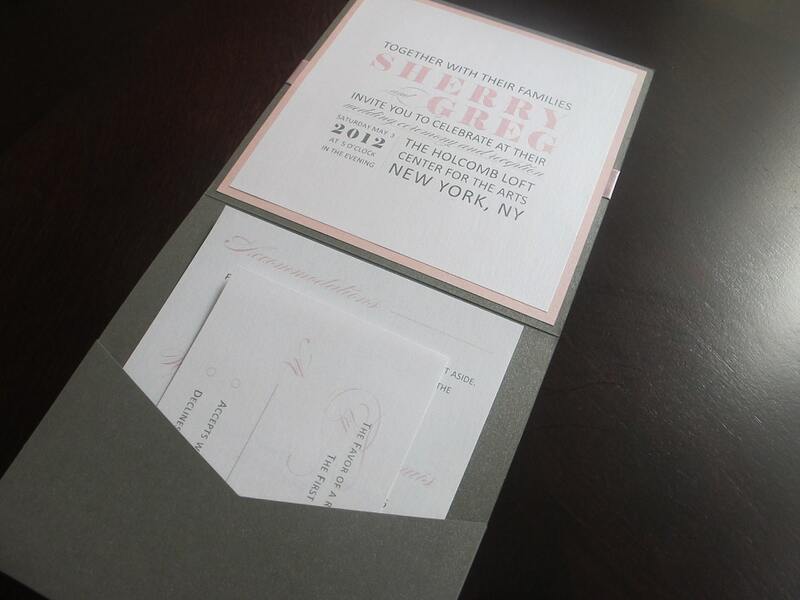 Once we started looking at the options, we loved the pocket invitations! We went with an invitation suite that is similar to these beauties below! This week we designed our programs, place cards and other fun miscellaneous stationary for the big day! Here are some inspiration photos! 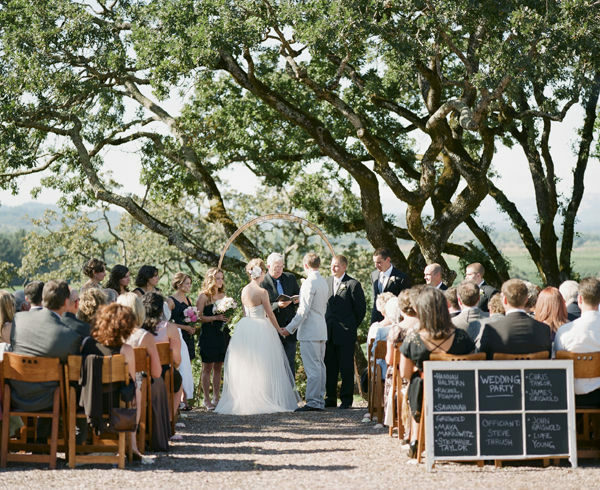 This is not our style but I LOVED the idea of showing the wedding party in the order they will stand. How clever! I can't wait to see the finished project and to share it all with you! Feel free to share with me your favorite wedding invitations and stationary!